As is often said, timing is everything in life and in business. The time will come when it makes sense to sell your company. Perform your due diligence, time the market just right and you will maximize the sale price of your business. Below, we delve into the three most important mistakes to avoid when selling a business. Sidestep these pitfalls and you will get the most possible money for the business you have worked so hard to build. Try to shift your perspective to that of potential buyers. 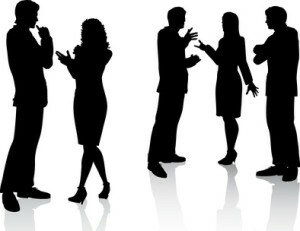 Consider what these buyers are looking for in a business, how they would like to be spoken to, the manner in which the business should be portrayed and other subtleties. Put yourself in the shoes of a buyer as you prepare your sales pitch. Position your business in the best possible light and you will have done your part to maximize the company’s value. When in doubt, focus on the small stuff. Prospective buyers are in search of companies with autonomous personnel who are not over dependent on ownership. Buyers also seek companies with ample opportunities for growth, a diverse customer base and a positive reputation within the community. Do not hesitate to document the improvements you have made to the business as well as pending improvements to show operations will only get better. The typical business owner has a number in mind that will justify selling the business. This figure is typically higher than the company’s worth yet there is the potential for it to be lower, depending on market factors, debt, other financial ties and so on. It is important for business owners to understand the value of their business. Each unique prospective buyer will assign their own distinct value for the business. The value each bidder assigns to your business is determined by what they feel it is worth to them at a particular moment in time. Consider market conditions, comparable sales in your region of similar businesses and the timing of the sale before setting expectations for a certain number. If your expected selling price is unreasonable, you run the risk of holding on too long, mistiming the sale and receiving significantly less than you should. Though you cannot time everything to perfection, you can control the point in time at which you put your business up for sale. If you wait too long, offers will eventually dry up. Market conditions have the potential to change. Your business might not appreciate in value as you wait for a better offer. 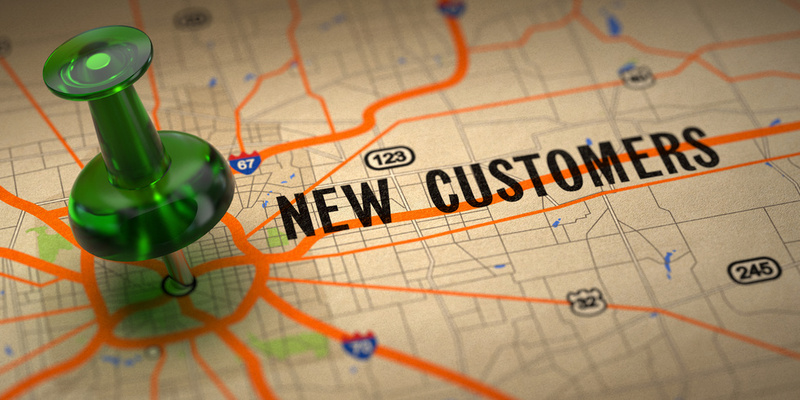 Even alterations to the industry your business operates in can affect your company. Negative local economic news can also reduce the value of your business. In fact, your business itself might decline in value as you wait for that eye-popping offer. Don’t be afraid to take an offer if it meets or surpasses your asking price. According to a study done by the University of Scranton, 39% of people in their twenties will achieve their resolution each year, whereas a dismal 14% of people over 50 years of age will keep theirs. According to another study, 75% of New Year’s resolutions will last the first week, but only about 46% will make it past 6 months. While most New Year’s Resolutions are about breaking a bad habit or losing weight, there are many other resolutions that people set that do not actually become achievements. According to a Business Insider article quoting Professor Amy Cuddy, social psychologist from Harvard Business School, setting New Year’s Resolutions are bad for most people because, as she stated, “We’re really bad at setting reasonable goals,” . . . And when we don’t meet an unreasonable goal, we fill ourselves with feelings of anxiety and lower our self-worth. 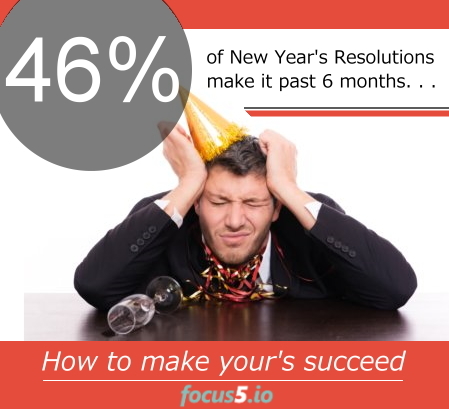 The team at Focus 5 agrees with these failure indicators, and have several practical solutions which are proven to make resolutions and goals 3 to 10 times more achievable. Knowing why resolutions fail, and how to set them more appropriately, while also understanding your own psychological dynamics of success over failure will help you set more reasonable resolutions and increase your chances of personal success and positive change. So how can you make resolutions that actually work (whether it’s New Year’s or not)? Goals must be flexible – if your goals or resolutions are too concrete or absolute, a mistake, missed day, or small failure will make you feel as though you have failed or in some cases, failed completely. Thinking in terms of making small improvement steps toward a positive goal is a better way to face your resolutions. If you fail to meet a certain goal during your first week, look at the progress you did make and pat yourself on the back for reaching 50%, 70% or whatever attempt you made. Start new the next week and try again. For example: If your goal is to quit smoking, getting from two packs a day down to one pack a day is significant progress! Remember, some of the best baseball hitters struck out nearly 7 out of 10 times at bat! Goals must be framed in a positive manner – Even in the world of marketing and advertising, negative headlines, or headlines that signal to people the possibility of avoiding a negative situation, have a tendency to get a worse response rate than headlines that stress the achievement of positive things. 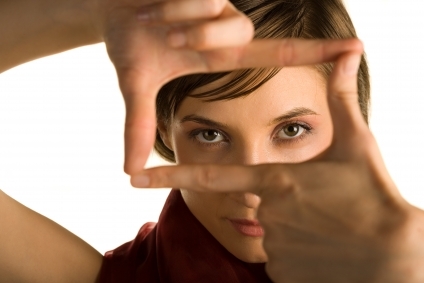 Frame your goals in terms of positive achievement instead of what you won’t do or what you want to avoid. Focusing against the negative actually brings the negative to mind more often, reinforcing its existence. Instead of making a goal to avoid junk food, make a more specific goal to eat healthier by adding more fresh fruits and vegetables to your weekly diet. Give yourself a weekly rest or Sabbath from your goal achievement to reinforce a reward and to experience a normal weekly rest cycle. The Body For Life Program is a very successful diet and exercise program that has defined exercise and eating boundaries for 6 days, but allows you to rest and eat anything you want on the 7th day. It follows normal weekly and daily circadian rhythm ideas which fit our natural body rhythms and helps reinforce cycles that are already natural. Use short-term, achievable goals – Goals that take 6 months or a year to accomplish fall off the radar of many people because the reward is not immediate enough to reinforce the changes in behavior or effort required to sustain the changed behaviors. As noted in the study above, only 46% of New Year’s resolutions make it past the 6 month mark. Goals must focus on the small incremental steps it takes to reach the mountaintop, and not the mountain top itself. By breaking your annual goal into quarterly, monthly and weekly benchmarks with small rewards will allow for a daily or weekly positive feedback which can be a powerful intrinsic (internal) motivator to keep you going. Literally, people who climb mountains as professional guides do so in stages and reach certain plateaus every day on their multi-stage journey to the top. Each goal to the next camp or resting spot is attainable within a day or so of climbing, so that the entire mountain ascent is achievable 1 day at a time. 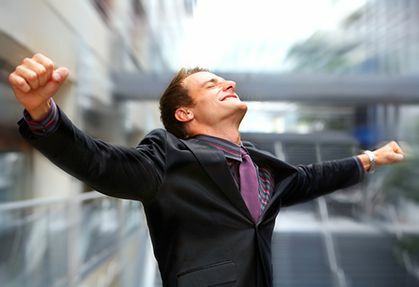 Employ Rewards – Rewards should be put in place to help bolster short term goals or benchmarks reached. You should reward yourself with small, meaningful rewards each week, bi-weekly or monthly, depending on your achievement and budget. Rewards could be as simple as an extra day off to read, play with the kids or go fishing or golfing, whereas a quarterly reward might be a 3-day weekend away on a mini vacation or “break-ation” or even a mini “stay-cation”. The key is to reward yourself appropriately and have the discipline not to reward yourself with things you already do during the regular course of your normal living or lifestyle. Accountability with a partner or group will help you achieve much more than you normally would because people typically do not want to let other people down. Accountability is a powerful motivator. If you are working in tandem with a few other people toward similar goals, the likelihood of success multiplies as well. Joining the group had many other intangible benefits that were soon realized. 5- We realized that none of us reached 365 days of perfect achievement, but we all achieved much more activity and well-being than if we had not taken the challenge. 6- We all felt the achievement and realized 10,000 steps a day is something we can now maintain for the rest of our lives. In summary, you do have the ability to achieve your goals and your New Year’s resolution if you follow these simple guidelines and are not too hard on yourself when you stumble or fall short of your benchmarks. The founder of Focus 5, Tim Scholten, created the Focus 5 concept and app to incorporate all of these tools and psychological advantages to help you achieve extraordinary results. The app is already helping many individuals, coaches and business owners realize goals they had not previously thought possible. The app includes the ability to set small, realistic yet flexible goals, gives weekly and monthly behavioral trends and reporting for feedback, includes the ability to add private accountability partners and teamsmanship, and helps you align your small goals on a weekly basis to reach your personal best. You can try the app free for 14 days and see for yourself here. Your ability to Focus is more than just a worthwhile thing to cultivate–it’s a critical factor in your success or failure. Getting things done is imperative, and focus is the key to getting things done. People who get things have more organizational value. People who get things done become the go-to people for the most important projects. 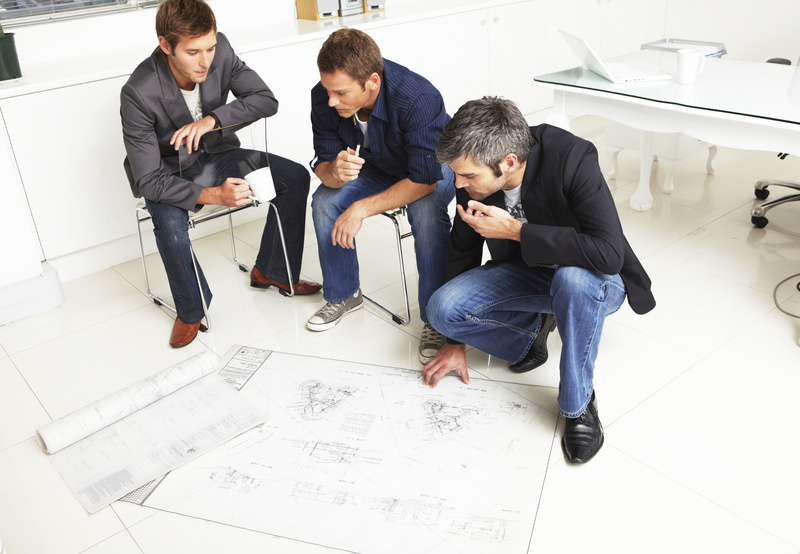 They are the people everyone one wants on their team or project. Here are 10 tips to help you stay focused at work by managing distraction, drawing healthy boundaries, and eliminating opportunities for procrastination. Start by planning the priorities for your week. Spend 10 to 15 minutes on Monday putting the top 5 things into Focus5 that will ensure the week is a success. Prioritize them. Use the priority feature to move an item to the top of your list. If it is a number one priority that isn’t due until the end of the week, you should still keep it on top. Otherwise Focus5 will automatically put tasks in due date order. Know what meetings or appointments you need to prepare for. Schedule tasks in Focus5 appropriately. A good plan will significantly improve your success. Where do your priorities come from? From your strategy. Your strategy can be broken down into Focus Sprints which are shorter in duration. Begin each day be reviewing your priorities and planning your day. Spend at least 5 minutes forming your game plan before you login to email. If you star your day reviewing email, the urgent little things soon consume your entire morning, robing you of your most productive time. Given your commitments, plan accordingly. Then check email. Recognize that priorities do change. When a new priority arises, plan it into the mix, reprioritize your week and your day. Move the tasks needed to the next week. Very few plans go perfectly. Your ability to flex and adjust without becoming frustrated will be highly valued by your boss and peers. Make sure that the priority work is getting the attention it needs. If your documented Focus Areas are really the top priority, that most of your tasks should be able to be directly linked back to one of those Focus Areas. Use tags in Focus5 to mark your tasks and ensure you are working in the most important things. One of the best ways to tune everything out is to tune in to music. When everything around you is distracting, shut the door, put on your headphones–find something that can serve as background music rather than music that holds your full attention. Music can help you concentrate, and the headphones signal others that you’re not available to chat. If your workspace is dirty, disorganized, or cluttered, invest some time in clearing it out so you can focus. Multi-tasking is one of the least productive behaviors. Research shows that both quality and quantity of work suffer from multi-tasking. Stop kidding yourself, you are not a great multi-tasker. Multi-tasking leads to fragmented thought and divided attention. Keep open only the programs you need for the project you are working on. It means less toggling and less use of your computers’ memory. It also means there is less chance of an automated reminder distracting you. Schedule the hardest things that require the most focus when you are at your peak performance. For some of us it is first thing in the morning. For others it is later in the day. Know yourself and work SMART. Getting up and moving around for just a few minutes every hour will help your concentration. Good blood flow to your brain will help you be more attentive. You can also use this time to head off other disruptions. Recording details of your accomplishments throughout the day as you complete segments of work or making notes with ideas for other aspects of the task will keep all your details and accomplishments in one place. Recording what you did and how you got there is rewarding in and of itself. Using Focus5 Tags will also allow you to tie associated tasks to a project and allow you to report and see the complete work history for that project. Just add a second tag to the task. This will allow you to set more realistic timelines and understand the work involved for similar projects in the future. Keeping good notes will also help you get back on track quickly when a necessary interruption does occur. When your task is large, spend a few minutes to break it down into smaller chunks of work that can be absorbed throughout your day. Most of us rarely have large blocks of uninterrupted time during a day to accomplish your work. Become great at chunking to make continued progress and have a greater sense of accomplishment. Use the performance tools in Focus5 to gain a better understanding of your work habits and distractions. You will have data for each day, each week and each quarter and for an entire year eventually. You will be surprised at the patterns and behaviors that are revealed when you use Focus5 to assess your own productivity. Know how you are tracking on each of your committed goals. Use your results to motivate yourself in areas that need improvement. If you have peers with similar goals find out where they are and use them as motivation to step up your focus. Aspire to become a top performer. Where you exceed your goals or peer performance, review how you got there and determine if there are repeatable patterns or behaviors that you can duplicate. Goals can be a great motivator to get more focused. Focus5 provides you with a weekly Focus Score. Measure your score over time and set a goal to improve your Focus Score. If you are hitting 100% every week, consider adding an additional task or two to further challenge yourself. When you achieve breakthrough performance with your Focus Score or when you have other breakthrough achievements relating to the quality or quantity of your work due to improved focus, reward yourself with a special with a special treat in recognition of your personal achievements. Remember that the real rewards of being focused is that both the quality and quantity of your work will exceed your peers. You will stand out as a star performer, and be highly desired for the most important projects or roles. Focus5 will also provide you with a wealth of accomplishment data come performance review time. Use it to get the credit you deserve and the raise or promotion that you have earned. Get focused and get ahead! I have been working with a young man who we will call Jack. Jack has been in the Mortgage business for over 10 years, but worked only in the operations area. Jack decided that becoming a commissioned based Mortgage Loan Originator would be good career move. The first move Jack made was a smart one. First he decided he knew very little about connecting with people and convincing them to apply and work with him. He did however know what a good loan file looks like. So once he had a prospect, he could put together a quality loan that would be complete 95% of the time. He knew his challenge would be making the right connections to make applications happen. So admitting he didn’t have the right contacts and didn’t know how to build them was the first smart move. Make as many internal connections as possible to start building a referral source. This included branches, consumer and commercial lenders, and call center staff. His commitment was to be available, keep his partners informed of what was happening to their referrals, and following through on things in a timely manner. In addition, he offered to be in the branches to show them how to uncover referral opportunities and then ask for the commitment to proceed. This started to immediately build Jack’s loan pipeline. Jack announced to the market that he was there to help clients obtain financing for their home. He asked his bank advertise his presence in the local a surrounding markets to let people know he was there and would provide advice on purchasing or refinancing their home. He started to see a few inquiries from this that began to result in applications. Jack knew he wouldn’t be able to survive on this alone while he is virtually unknown, but also knew that connecting with local realtors and builders and getting to know the key players that direct financing for the purchase market is a critical part of his long-term strategy. Jack asked these influencers what their biggest challenges were in working with Mortgage Lenders and took that feedback back to his bank to develop personal strategies that would overcome these challenges. Jack began sourcing a couple of new programs that others were not offering that would help differentiate him in the market place. He also started to develop regular educational programs for his target influencers. In addition, we began working on standardizing Jack’s communications with clients, prospects, referral sources, realtors, etc. Standardizing consistent communications in order to make staying in touch and simple as possible was the goal. We did this knowing the key reason deals fall apart is lack of communication, and the most significant reason clients become fans is because Jack would know their needs before they did. We worked with Jack’s internal support team. His processor and underwriter. Our goal was to equip and empower them to communicate directly with the applicant on Jack’s behalf, leveraging the communication standards we put in place. Our goal being to cut out the middle man (Jack) and make the requests for additional information and/or updates to the client as direct and efficient as possible. We categorized and prioritized Jack’s weekly call list. The goal of this initiative was to focus Jack’s attention on making outbound calls that were most likely to result in an applications. HIGH = Internal purchase referrals – make the call immediately today. Timing for these are critical. MEDIUM = Internal refinance referrals – Jack will need to do some homework and analysis on these and can expect an application from every 2 to 3 phone calls. LOW = Internal marking lists of potential refinance opportunities – Jack will need to do a bunch of pre-work to work through numbers and ensure he has identified real opportunities for these prospects prior to making the call. The most unique thing about these calls is the prospect is not expecting a call while in both HIGH and MEDIUM the prospect is expecting a call from Jack. The effort in these is significantly higher and the likelihood of making the right connection with an interested prospect falls significantly. However, when High and Medium leads run out, making these calls is still necessary to keep building the application pipeline. Jacks weekly goal is to make 50 contacts every week, regardless of his pipeline. That’s contacts, not calls. Talking to someone is the only thing that counts towards building a steady pipeline of new applications. We dedicated Tuesday afternoons to communicate progress to his applicants. Following a weekly pipeline meeting with his processor, Jack proceeds to update every prospect on the status of their loan request and pursue additional information needed to keep applications moving. He and his processor coordinate these updates. He assembles thank you notes and emails from satisfied clients to memorialize his ultimate accomplishments and to remind himself on those difficult and challenging days that what he does and the way he does it matters. It is that extra motivation to pick up the phone and make that call to help someone to purchase or refinance the home of their dreams. 5 approvable applications that result in a closing. So how has Jack done? Well, Jack closed 2 loans his first month, but began building a really nice pipeline. He learned through trial and error that prioritizing and making the calls was the key to keeping the pipeline flowing – missing a few weeks of calls due to closings or feeling of success last month can negatively impact your results next month. The second month Jack closed 7 loans for just under $1.0 Million earning the equivalent of his previous salary. Month number 3 finished at approximately $1.2 Million, and month number 4 is looking at in excess of $1.5 Million and 35% more than his salary. So far, Jack’s commission based income trumps his previous salary. With the number of satisfied clients in just 3 short months, Jack is on target to build a quality reputation as a Mortgage Loan Officer and improve his personal financial picture substantially. If you asked Jack the key’s to his early success he would say: Focus on the right things and maintain the discipline of doing them every day. Sounds easy, but is quite hard without someone helping to coach you out of doing what comes natural to you or what you like to do and into doing the activities that really matter. It is not an easy transition, but it is worth doing. I couldn’t have done it on my own. If you are in the sales or relationship business and struggling to meet the target or have a team that is not performing to your expectations, give me a call to see how we can help you make Visible Progress. In 2010 I had several community bank and credit union clients that were challenged to grow their organizations. Unfortunately consumers were just not borrowing at that time. The question they were struggling with was how to grow an organization when consumers aren’t borrowing? We weren’t asking about new debt; we were asking about helping them pay off their existing obligations sooner. This message connected with the customer base at that time. While everyone else was spending tons of money advertising trying to get customers who weren’t interested to borrow money, we simply asked existing customers if we could help them consolidate and save. The resulting conversation led to a significant amount of new business that was right under their noses all along. The moral of this story: Be more creative than your competitors in uncovering the opportunity with the right conversation. Pouring a ridiculous amount of money into advertising is not always effective. 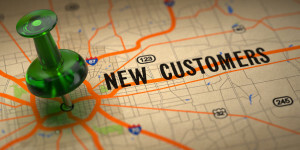 Simply start where your customers are right now. Find out where their pain points are and help solve them. Throughout the years following 2010, we’ve continued to use this approach to re-engage with customers and we continue to uncover new loan opportunities with both consumer and business clients, showing solid growth while others have struggled. If you would like assistance in determining what is going to appeal to your customers right now, give us a call at 614-374-2890 or email us at tims@visibleprogressnow.com . Fund Start-ups? Isn’t that something only the big banks do? Think again. For generations, community Banks have been the stewards of their customers and communities. They’ve been the incubators for innovation and taken financial risks on start-ups that have often become the bedrock of their communities. In some cases, these start-ups have become insanely successful and fostered sustained growth in these communities. While your community bank may not be located in Silicon Valley or some other tech-rich location, you still have the opportunity to invite, foster and support innovation in your local community. Job Creation: Let’s start with the fact that start-ups create four times as many jobs as any other large firm. 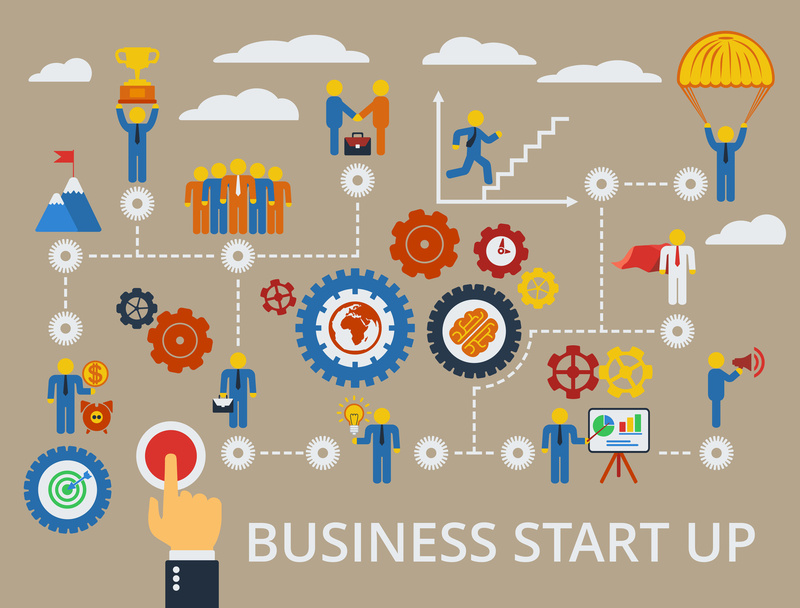 While not all of them survive, a steady stream of start-ups creates a steady stream of new jobs in your community. Stronger Teams: Creating a startup support strategy forces your bank team to engage with businesses on a whole new level. 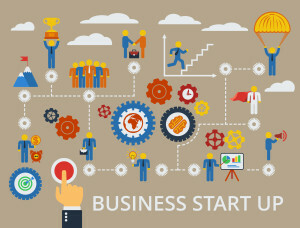 Start-ups need support and guidance in financial education, human resources, inventory management and control, understanding financial statements, obtaining investment capital, etc. 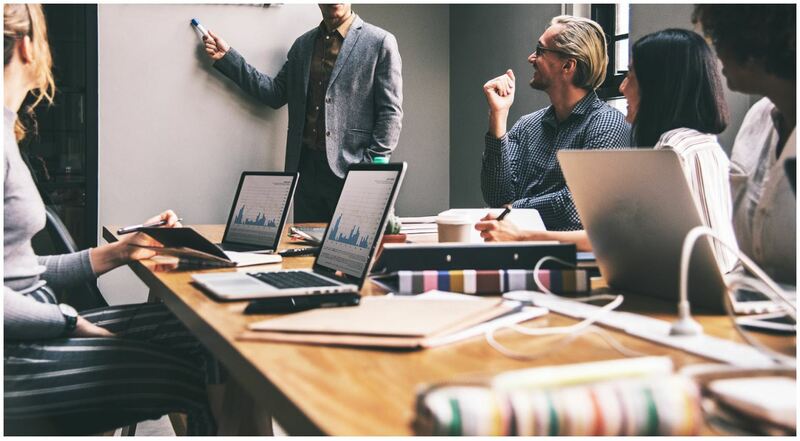 Taking ownership of and making this type of support available within your community will help to strengthen your own teams’ skills, as well as engage your business clients on a deeper level. Loan Growth: A pool of start-ups can lead to a few new promising businesses. This can, in turn, help overcome the stagnant loan growth problem that many community banks are experiencing. New Customer Markets: Millennials are more entrepreneurial minded and on an earlier curve in starting their small businesses. Community Banks should support and welcome this new, creative generation. They are your future clients. They get involved in the community. 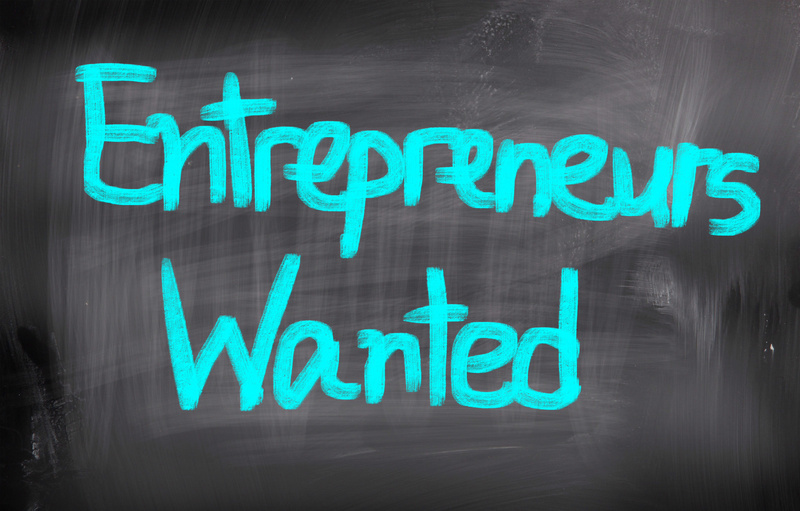 Helping to educate and nurture this entrepreneurial talent is a great way to engage with this generation. Pride: It is REALLY FUN when one of your own succeeds! Provide financial education and offer constructive feedback on business plans. 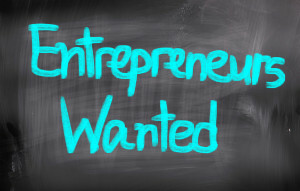 Provide access to peers and other successful entrepreneurs that can help validate and refine business models. Establish an incubator program in your community to assist start-ups and help source investment capital. Start a “Community Social Investment Fund” to help fund start-ups. Get other businesses and interested community members to contribute to the fund. Provide matching funds to incubator and start up programs as a community reinvestment. Provide loans for worthy candidates. What I am really talking about here is fostering an entrepreneurial attitude within your Community Bank. I think you will find it to benefit and influence how you and your team think about your own business. Maybe you’ll do something innovative and exciting that will transform our industry. If nothing else, you will bring some good old fashioned fun and innovation back into our slow-moving, over-protective, regulation-ridden industry. December is a time when many organizations tend to slide into neutral. With not much left to do to change results for the year and having to wait to jumpstart the coming year, people often check out early. Unfortunately, that is exactly what many of your employees are doing right now. It has been a long and challenging year, and the idea of 2015’s challenges may be too daunting for them to even think about. This is exactly the time to consider a new approach to motivating your team. Too often recognition is tied to bonuses or pay increases or celebration parties. While very important, it just isn’t enough in today’s world. What people really crave is recognition. I am not talking about walking around like a robot, giving pats on the back for achievement of certain tasks or reaching a specific goal. I would call that constructive feedback and affirmation; something people also need. Just a few of our Super Stars! Instead, start by using an event in December to recognize a few team members who have gone above and beyond in terms of their efforts. That accountant who burned the midnight oil to get needed quarter-end regulatory filing out in a timely manner while key people on her team were away on medical leave. Make sure she feels the deep appreciation you have for the time she sacrificed being away from family or missing out on other activities. People need to know their commitment, efforts, and personal sacrifices are recognized and appreciated. Consider others who have gone above and beyond. One that without their extra effort and sacrifice, your 2014 could have turned out much differently. Often times these are not your typical lime-light individuals. But consider what recognizing their efforts in front of their peers could do to reaffirm their personal commitment to the organization as well as motivate others. We all have a deep need to be acknowledged. Make sure you close out this year by appreciating those who deserve it. Then commit to making this a regular habit. Being grateful and showing appreciation for others contributions is a wonderful character trait of a respected leader. Timely – Be as timely as possible with feedback. The closer to the event the better. Catch people doing exemplary work and acknowledge their efforts. Again, you are recognizing their efforts. Don’t feel you have to recognize everyone or you will just water down the value. Showing up for work on time does not count–it’s a function of keeping your job and doing what you are paid for. Authentic – You have to mean it when you give employees recognition. So often we feel the need to recognize everyone equally when the effort contributed is not equal. Two people may have achieved the same goal, and for one it was a breeze, while the other had to overcome adversity. Maybe a death in the family or aging parents requiring extra attention. Recognizing that their results matter and that you understand the extra effort required of them will show they matter more to you than just as a warm body in a seat. Equal recognition in this case will water down the value of your appreciation. Specific – Recognition is most effective when it is tied to the greater goal or objective of the organization. Recognizing the employee who went above and beyond to land that business deal matters. The importance is that you acknowledge the effort the employee put forth to ensure the success of the business unit. Motivational – Money is appropriate much of the time, but it’s not the only – or even the most effective – motivator. Treat employees as valued team members. Most of the time you will get more mileage from the recognition than the money. Be the kind of leader others want to follow. Genuine appreciation and recognition in December will go a long way in getting your 2015 off to a great start. Then figure out how to make this a regular part of your week and month. If you need help getting started, give me a call. I would love to help YOU make 2015 even better than this year. Service with a Smile Never Goes out of Style! Even in our lightning-paced, 24/7, device-driven world, a few things will never go out of style — like a firm handshake, a sincere compliment and service with a smile. Sounds quaint, I realize, but think about it: how are you treated at your favorite coffee shop, restaurant, clothing store? Chances are, any place where you willingly spend your money time and again probably has a staff that treats you well. Why else would you go there, when there are so many other choices available? So maybe quaint is not so bad. In fact, when we’re talking about achieving excellence in customer service, maybe quaint is actually good. And when it comes to your business, where you expect your customers to spend their time and money, why would you expect them to stick around if your customer service isn’t the best in the neighborhood? According to a recent research study completed by Oracle, 73% of customers cited friendly employees or service reps as the key factor that influences their loyalty to a business. * Furthermore, 86% of customers said they are willing to pay more for a better experience. Did you catch that? People are willing to pay more for a better customer service experience. How would you rate your client’s service experience? Do you know for sure what your clients think of your customer service? Or, if you’re honest with yourself, do you even have any real idea at all? This is one of the most important factors in retaining your customers for the long-term: how much time have you spent training your associates on the basics of good, friendly customer service or actually asking customers what they think? Interestingly, the same study showed that only 1% of respondents indicated that their expectations for a good experience were met 100% of the time. Which leads me to this question — with customer service being such an important factor in determining customer satisfaction, why have so few businesses been able to achieve loyalty as a result of their service? Part of the issue may be insufficient training in, or even awareness of, the importance of friendly service; the other part may be the result of lack of service representative availability. The study stated that 58% of customers indicated that their expectations for good customer service were not met because the company was not available by phone or email. 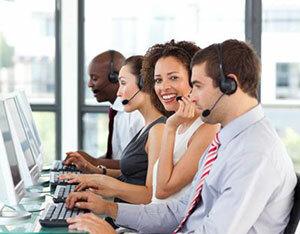 Having a great customer-focused call center can be a real asset for a company of any size. If your associates are equipped with the right tools and information and, if they are empowered to act and resolve issues on behalf of clients, they can help to create the kind of loyalty this study is referencing. It goes on to state that 56% of companies are slow to respond or resolve issues — more than half. Clearly, that’s just unacceptable. The good news is that 99% of companies fail to achieve this! So there’s lots of room at the top — and that’s where you should be. Don’t be one of the 99%. With the right training and focus, you can achieve highly available, friendly service, that consistently responds to and resolves customer issues. No matter what your business model is, you can achieve this goal. 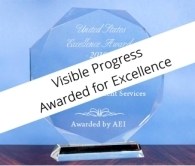 For help, check out our Customer Service Excellence Program at www.visible-progress.com. Even good managers can miss early signs of trouble. You are working, hard running the business day to day, when a new competitor emerges or a new innovation completely disrupts the way you are doing business. 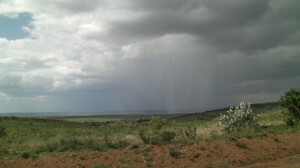 The reality is you may not have seen the storm clouds gathering on the horizon and now you are facing new head winds. 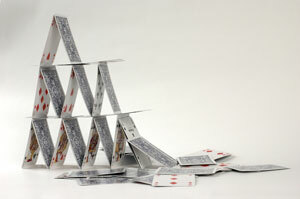 People caught off guard often jump into action without complete understanding of their challenge. As a result, their early actions may just mask a much deeper problem. A quality diagnosis of key business drivers is necessary to ensure that you are not just treating the symptoms. So be sure to dedicate a reasonable amount of time to assessment before springing into action. Show them the trends — how you got here and what needs to change. This will help to create a sense of urgency within your organization. When the entire team is engaged in assessing and addressing your challenge, you will likely uncover the deeper issues, better solutions and experience less resistance to change. EXAMPLE: guard by ABC leaving, it critical that we do a quick assessment of our products and pricing to ensure this is a single incident versus the beginning of a trend of losing multiple customers. Over the course of the next week, we will be asking for your help in doing detailed product and pricing comparisons across all of our competitors to validate our product and pricing approach. We will also be meeting with our product vendors to ensure we are doing all we can on behalf of our customers, from a product design and technology view point. Your feedback and input during this process is vital to our ongoing profitability. Your associates likely have some insights into the problem and potentially information about how your competition is dealing with the same or similar issues. Often associates have seen the issue for some time but have never spoken up. This is a great opportunity to improve communication, enhance teamwork and ensure that all associates feel free to bring up issues and offer suggestions. 4. Ask yourself: am I missing critical talent? You may not have all the talent you need to quickly work through this challenge. Don’t hesitate to bring in the right people to contribute to the solution. Often, teams are so busy running the business that they have little time to quickly address the real problems. Outside resources can help you quickly define a plan of action, prioritize action items and ensure that critical changes are taking place quickly and effectively. Companies need to invest their capital wisely and in areas that provide real returns. If your division is adding to overhead without adding a sustainable profit stream, you have only addressed the short-term problem. The long-term picture needs to demonstrate that further investment is warranted. In some situations, you may need to engage your suppliers for help. That help can include their expertise, price reductions, improved payment terms or better technology integration, to ensure you are operating efficiently. Leverage your change story to ensure that your suppliers see the long term benefit of partnering with you through this crisis. A few quick wins early in the recovery will create momentum and demonstrate the value of change to your associates and build confidence in your leadership. So, in review… Assess the situation quickly and honestly. Formulate and implement a smart plan that will create revenue and generate quick wins. Bring your employees in early and engage them as an integral part of the solution. Marshall resources — look to vendors and consultants for short-term support. These are just a few ways you can get ahead of that storm to prevent damage — and spend less time cleaning up debris.